There are tons of 48-inch professional ranges available. In fact, there are more than ever. You have many options, but it is confusing to buy the right one with the best features for how you cook. 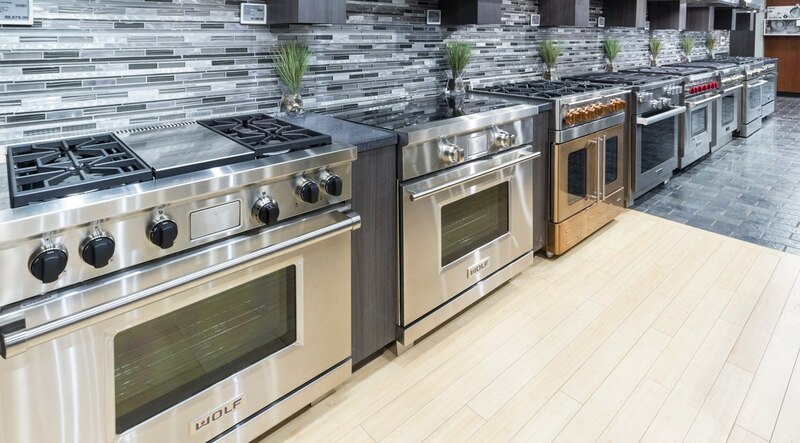 Popular brands in this category include (but are not limited to) Wolf, Thermador, Miele, Dacor, Jenn-Air, BlueStar, Viking, GE Monogram, DCS, and Capital. In this article, we will answer many of your questions regarding output, simmer, grill, griddle, and oven features. You will learn the difference between all gas and dual fuel, different features for each range, the list of the best brands, and then rate the best range on how you may cook. Be advised, there is no best range for every feature (shopping would be much easier if that was the case). What is a Professional Range? First, let's define what you are considering. What is a Pro Range? Professional style ranges (pro ranges) are modeled after ranges found in restaurants with high BTU output and a commercial look. However they are rated for residential use, so you do not need special permits or sprinkler systems. They are also easier to clean. There are many pro-style ranges like Bertazzoni, ILVE, and Verona. They lack the high output of the other brands, so I did not include them in the comparison. They are less expensive if you need a cheaper range to fit a 48-inch opening. Before we talk about brands and models, you should know the difference between all gas and dual fuel (gas over an electric oven). Gas ovens have a moister heat and electric ovens have a drier heat. Moist heat is better for roasting meats whereas electric is better for baking. On average, dual-fuel ranges have a more accurate temperature than all gas ranges because, with an electric oven, it is easier to control the temperature for precision cooking. 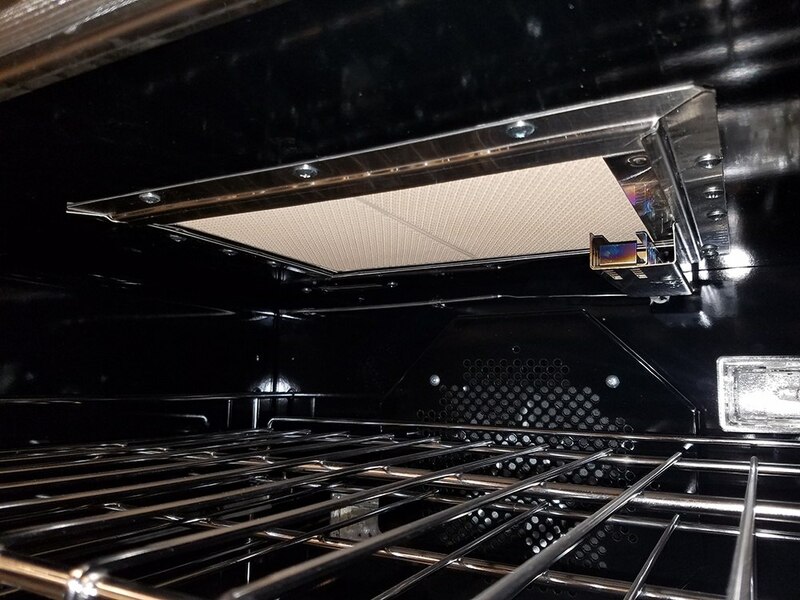 All-gas ranges typically have better broilers, especially if they are infrared broilers, and will sear better than electric. Part of that difference is due to temperature precision; however dual fuel ranges typically incorporate more advanced features such as self-cleaning, a timer, and sometimes, menu-driven electronics. Wolf and Miele will have enhanced features available only in their dual models. On average, all-gas ranges are about $1,500 to $4,000 less expensive than dual fuel ranges in the professional-style category. 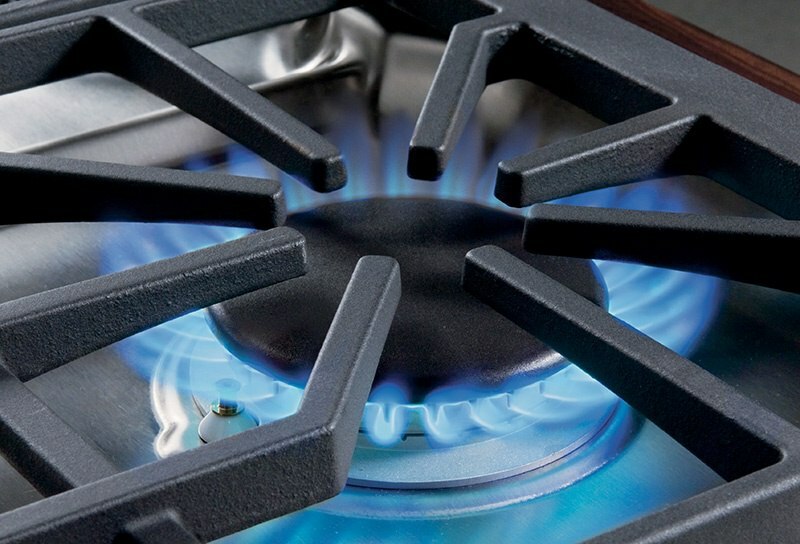 What should you look for in an all-gas range? Many all-gas ranges give you some opportunity to customize your range’s surface configuration. Most brands will offer six burners and a griddle. Some brands will give you the option for a grill while others offer a grill and a griddle. A select few will offer a French top or all burners. In this blog, I will focus on the top selling cooktop configurations. Wolf is the cooking brand owned by Sub-Zero. Wolf is made in the US. They are best known for professional-style ranges with their signature red knobs. Wolf is a top-selling range brand in the New England market. Their 48-inch range is one of their top-selling styles. Their grill is infrared and is similar to an outdoor gas sear zone providing you less cleanup because the infrared will evaporate drippings. Thermador is the cooking brand owned by BSH Home Appliances Corporation. Although BSH is a German corporation, Thermador is made in the US. They are best known for professional-style ranges, aggressive package offerings, and their rebate program. With their rebate program, you can receive a free dishwasher. Thermador is a top-selling range brand in the New England market. Thermador makes two different series of ranges - the Grand series and the Harmony series. The Grand series is the premium offering of the two with a large capacity oven, high BTU burners, and self-cleaning. Both ranges have the star burner, which can simmer better at 100 degrees. It is also raised for easy cleaning. Jenn-Air is the premium brand made by the Whirlpool Corporation. Jenn-Air ranges are made in the US. 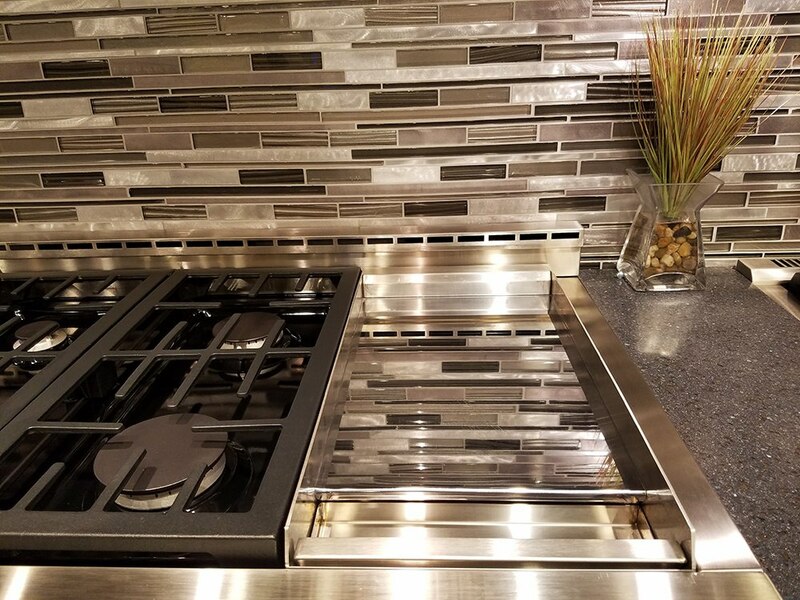 Although Jenn-Air was originally known for making downdraft ranges, since Whirlpool’s 2008 acquisition, Jenn-Air has been a heavy contender in the mid-to-high-end appliance market. Jenn-Air has some great package offerings as and is the only brand listed where you can buy a full package suite of appliances with your choice of a matching integrated or freestanding refrigerator. This means that if you want to get a 48-inch range and you are not looking to spend over $4,000 on your refrigerator, you are in luck with the Jenn-Air brand. Plus the finish and handles will match because it's the same brand. Jenn-Air has a few key features. 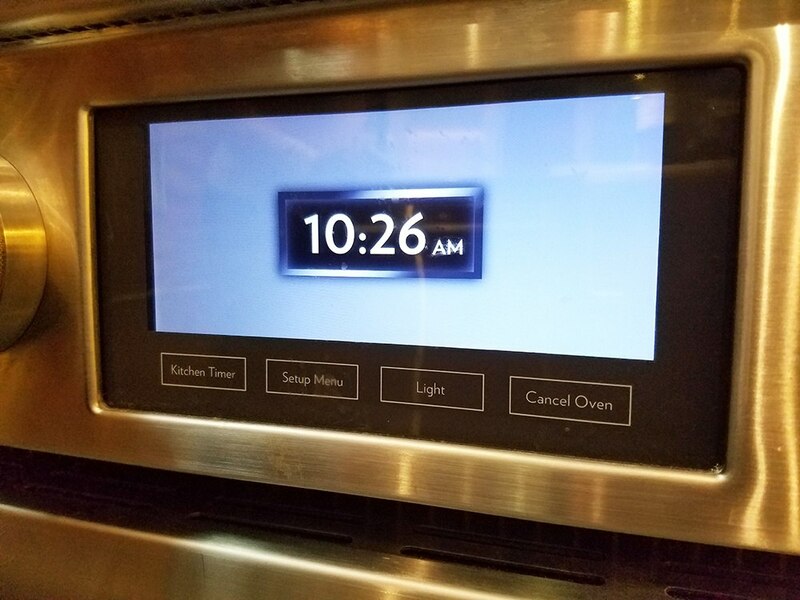 Their clock and timer are the best of the bunch with convection conversion. You can convert your regular recipes into convection by hitting a button. Their chromium griddle is the best to clean. I have watched our chefs burn food before and easily wipe it off. It is also self-cleaning with twin convection to spread heat more evenly. BlueStar is a commercial cooking company that originated in Pennsylvania. Of this list, they are the most commercial-style of the pro ranges listed. BlueStar ranges are primarily known for customization. They come in 750+ colors and trims. BlueStar is a company in which you can also customize the cooking surface for an added cost. BlueStar’s Platinum series is their premium range line. This range line has open burners, ideal for getting a very high heat. 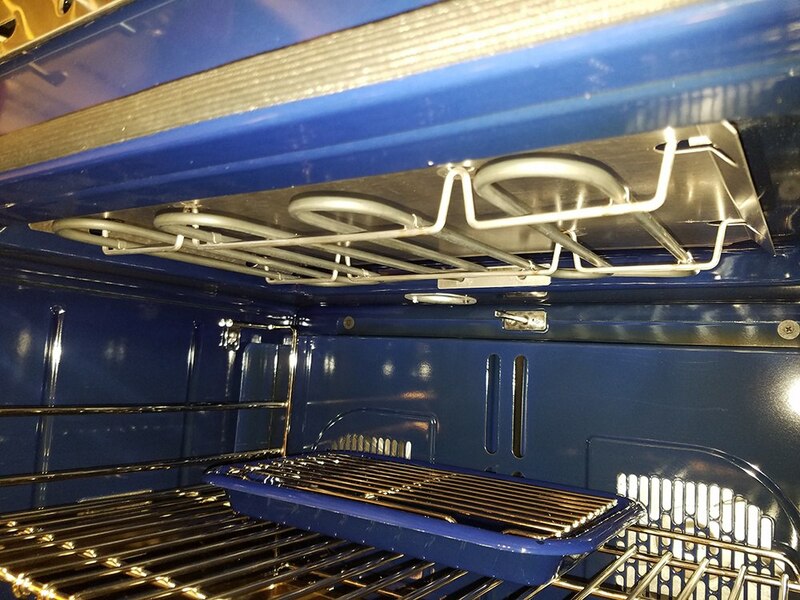 The infrared broiler cranks out heat to 1,850 degrees and the oven is large enough to handle a commercial cookie tray. If you are looking for a range that has commercial characteristics or if you want a pop of color in your kitchen, you should consider a BlueStar platinum range. Which Range is the Best? Your decision will likely come down to which features are most important to you. So, we took the liberty of breaking down some of those features for you. BlueStar has the most at 25,000 BTUs. For sealed burners, Jenn-Air has 20,000 and Thermador has 22,000. Viking has 23,000, but overall reliability is part of this list, so we do not carry Viking. 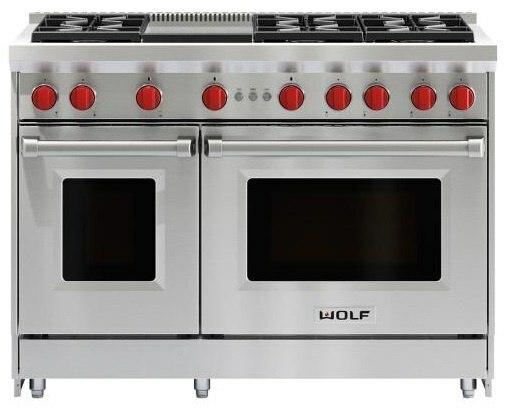 Wolf offers the most cooktop configurations of any 48-inch range brand. Keep in mind, when you commit to a configuration with Wolf, you are married to that configuration. Be cognizant of how you cook and choose a configuration that works best for you. BlueStar gives you the most flexibility. Their range comes with 8 burners yet gives you the option to upgrade the power of those burners or use their included grill/griddle accessory. Since these ranges come specifically for natural gas or liquid propane, you do not need to convert the burners to LP (which sometimes causes a loss in burner power). Thermador’s XLO burner (intermittent simmer) and Wolf’s dual-stack burner are the two best burners for simmering in the industry. For indoor grilling, having a gas-powered grill will be better for sear and taste than an electric grill. It is infrared so the drippings burn off for easier cleaning. Having a chromium-infused griddle will be the easiest for cleaning and maintenance. Wolf will have an infrared gas, so it will heat faster. Both Thermador and BlueStar can hold a commercial sheet pan, the other companies cannot. 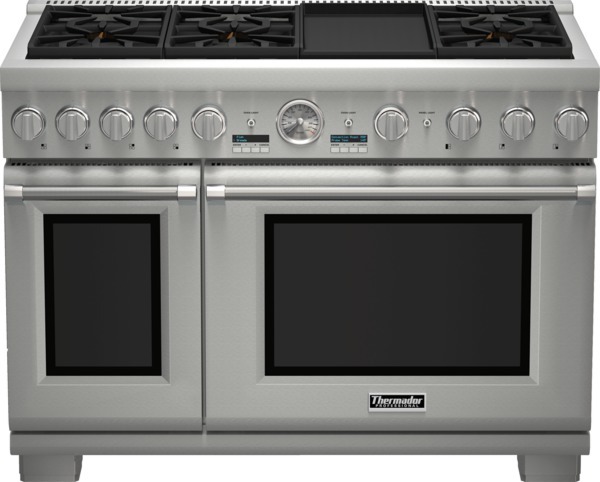 If you are looking for a large oven, BlueStar and Thermador are the best choices. Thermador and Jenn-Air both offer self-cleaning, built-in timers, and telescopic glide racks. The others do not. Jenn-Air is the only range that made this list under $8,000. They have some great package promotions as well. If you are looking for a 48-inch pro range but aren’t looking to break the bank this is a great range for the price. Both have infrared and will sear the fastest. There are good options depending on what is important to you. For cleanability, Jenn-Air would be a good option. For power, BlueStar is the most powerful on the market. Thermador is a nice combination of all the features including self-cleaning, and a powerful top. Once again, it depends on what you need. 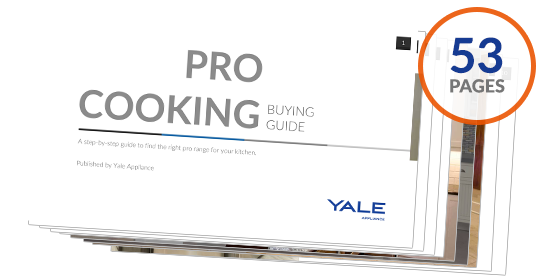 Get our free Pro Cooking Buying Guide with tips, trends, and reviews of all the best brands. Over 240,000 people have already found answers in a Yale guide. Editor's Note: This article was originally published on February 25, 2015, and has been updated for accuracy and comprehensiveness.